Individually packaged spatulas for bead dispensing. PCR clean, DNase and RNase free. Why use a messy ice bucket when preparing your samples? 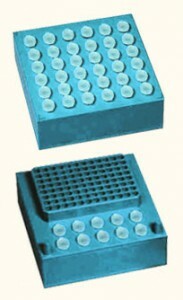 The Arctic Rack keeps your samples cold while safely containing them in microtubes. The Arctic Rack maintains a temperature of approximately 0°C for up to 4 hours. One side is a convenient PCR work station and the other holds 36 standard 1.5/2.0ml microtubes. Our Noise Reduction Enclosures are built specifically for the Bullet Blender ® using specialized noise reducing foam to provide excellent sound containment and dampening. The enclosure will reduce the noise level such that you can have a conversation at a normal level while standing immediately next to it. The NRE-2 noise reduction enclosure comes with a cooling fan to prevent heat from building up inside the enclosure during Bullet Blender ® operation. Fits all BBX Bullet Blender ® models. 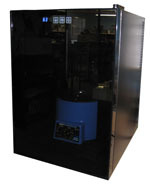 This refrigerated enclosure reduces noise from the Bullet Blender ® even more effectively than the Noise Reduction Enclosure and also provides active refrigeration to keep samples even cooler! The thermoelectric cooling is environmentally friendly and never requires recharging. Cools down to 54°F (12°C). Features a double-paned glass front, integrated Bullet Blender ® power supply, internal LED lighting, digital temperature display, and touchscreen controls. 16 inches wide by 21.5 inches high by 20 inches deep. Fits all BBX Bullet Blender ® models. Replacements for worn gaskets on lids. To ensure that you are getting the best homogenization with your Bullet Blender ®, worn gaskets should be replaced. While purely cosmetic wear will not impede performance, your gaskets should remain flat. To determine if your gasket is in need of repair, run your finger across it. If you can feel indentations made by the tubes hitting the lid, then you should replace your gasket. Available for all Bullet Blender ® models.